Keith Millen says MK Dons have to approach the remainder of the season without fear of relegation. Dons have won two back-to-back, beating Rotherham and Bury, but remain two points from safety in the League 1 drop zone. And with nine games remaining this season, assistant manager Millen says Dons cannot afford to fear their position, but have to play with confidence if they are to escape the bottom four. "You can't fear the position we're in, whether you're fighting for promotion or relegation," he said. "You've got to take the challenge on. The players seem very positive considering where we are. "We've got nine cup finals, and we know we won't play well in every game - it's about getting points now. We need to focus on how to do that. We want goals and attractive football, but we need to win games. We have to keep the pressure off the players and enjoy the challenge." Blackpool, one of Millen's former clubs, head to Stadium MK sitting 15th in the league. And though they are six points outside the drop zone, Millen believes the Tangerines could still get dragged into a relegation dog fight. Millen continued: "Gary (Bowyer) has done a great job there. 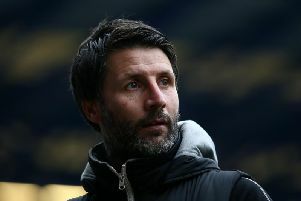 The fans have been in dispute with the club, but Gary has kept the players quite focused. They are reasonably safe, but not safe yet. They're a decent footballing side, and I'm sure they'll look to coming here to enjoy themselves. But we can't let them do that. Bowyer agrees, and says his side are taking their remaining games one at a time in their bid to retain League 1 status. “We’ve just got to concentrate on ourselves heading into these final nine games, starting at MK," said the Blackpool boss. “It does seem like a long time since we played them at home, it feels like a long time too. “It was a nice sunny day and it was Longy (Sean Longstaff) who scored for us. It was a long time ago and they’ve obviously been through a change of managers since then. “But I can’t stress enough, it’s about how we approach the game and about how we go about it. One thing for certain is we know it’s going to be a nice big pitch down there.